Listen well, young grasshopper, for what we have to say about this pest will benefit you. The grasshopper is a single branch on the vast tree of the genus Caelifera from the Orthoptera family. It`s easy to confuse grasshoppers with other pests since appearance-wise they look similar to their cousins: the cricket, the katydid, and the locust. Once you recognize the differences though, it will help identify and treat your current pest problem at a faster rate. The grasshopper goes through metamorphosis just like a caterpillar…well, an incomplete metamorphosis, anyway. It starts out as an egg, and then it hatches into a nymph before it grows up to be a young grasshopper. The caterpillar stage is skipped entirely. Grasshoppers have short antennae compared to their cricket cousins and most are green or brown like grass, hence the name. This colouration helps them stay camouflaged and safe from predators. They are famous for having long, spindly, and spiky back legs. These legs are what help them be excellent hoppers and severe Olympic competitors to the flea by leaps and bounds. 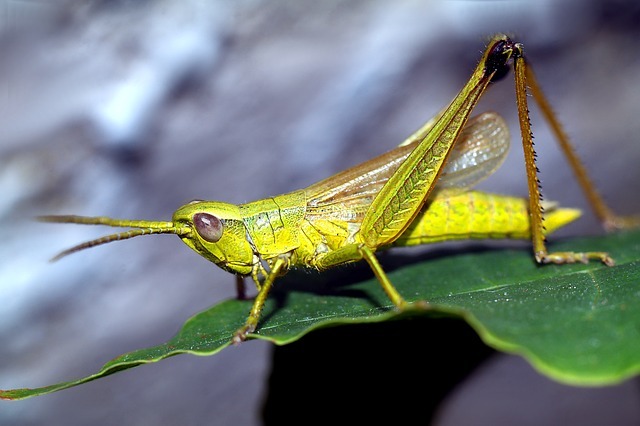 This hopping ability is what makes the grasshopper a tricky varmint to catch and eradicate from buildings, fields (if your business involves agriculture), and gardens if you discover an infestation. Luckily, it’s easy to tell when one too many have decided to set up camp. Their back legs not only help the grasshopper get around but also to communicate. They will rub their legs together to make the infamous thrumming sound that is best associated with long, hot summer days. So, if you hear one where it shouldn’t be, such as in the kitchen or your bedroom, you’ll know you have a pest problem. A grasshopper infestation typically emerges during the hot summer months; the hotter and drier the climate is, the better. While grasshoppers usually prefer to make their homes outside in the wilderness, they are terrible varmints if they get at your crops or garden or, in rare cases, get inside of your house! Once an infestation has broken out, your plants and food are at risk! Normally the discovery of a grasshopper is considered to be a symbol of good luck…that is, if they’re outside. Inside, the grasshopper can be a crazed fan of the cereal in your cupboard. This is because cereal plants, as well as many kinds of grass, are the grasshopper’s favourite food. If this has helped you identify your current pest problem, and there are too many young grasshoppers around that are hopping mad, give your local Pest Boss a call. We’ll get you, varmints!